1x Arduino 101 with Intel Curie the brains of your bot! It's a board that combines the universal appeal of Arduino with the latest technologies - like the Intel Curie module, Bluetooth LE capabilities, and a 6-axis accelerometer/gyro. 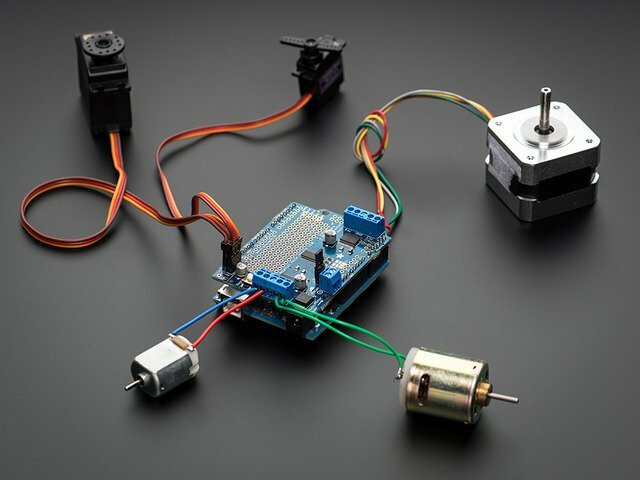 1x Adafruit Motor/Stepper/Servo Shield v2 - Lets you drive up to 4 DC or 2 stepper motors- certainly enough motors to power the chassis kit! 1x - Mini Solderless Breadboard - 4x4 points - Perfect fit for your chassis kit. 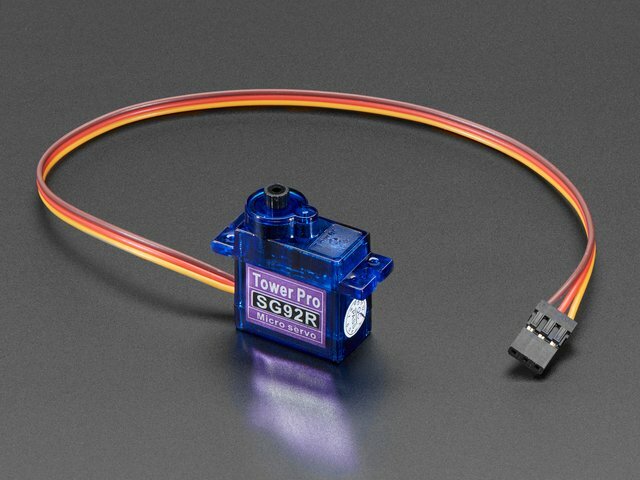 Add it to the prototyping area to upgrade your robot with more sensors, lights, servos and beyond! 1x 4xAA Battery Holder w/ On/Off Switch - A nice portable battery holder for your robot's motor batteries. 1x Shield stacking headers for Arduino - Solder these to your MotorShield to allow access to all pins for further upgrades later! To use the Arduino 101 board, check the Arduino IDE Tools > Board list and select Arduino 101. In case you don't see that board choice, you can click on Arduino IDE Tools > Board > Boards Manager... and then sort the list in the Boards Manager search bar with the word "101" and then update the AVR boards definition and install the 101 board as seen here. For your robot to work correctly, you will need to install the MotorShield library. To install libraries, we will use Arduino's handy library manager. Navigate to the library manager like shown in the screenshot below. Now that you have the library installed, let's open up the example sketch to try out the DC motors on your robot. You can find the example sketch DC Motor Test in the Arduino File>Examples>Adafruit Motor Shield V2 menu. Open it and upload it to your CurieBot. Note this snippet of code below. It's instructing only Motor 1 to rotate. Place your robot on top of a cup or mug so the wheels are not touching the ground. With the motor port changed to 2, the other motor should now run. That is really the basics of how we will go about controlling the robot. In this case, we have myMotor set to M1, which is our right side motor, and myOtherMotor is set to M2, our left side motor. To take this robot to the next level, we are going to modify James De Vito's awesome code for the similar Red Robot Rover. In his code, he has multiple control methods where you can either use the Bluefruit App controller or use your phone's accelerometer to drive your robot. For this example, I am going to simplify things and we will just use the control pad. This will free up the four auxiliary buttons for some customization which we will cover later. For this code to work, we will need to install a library. See the previous step on a really easy way to install this library using the Arduino Library manager. 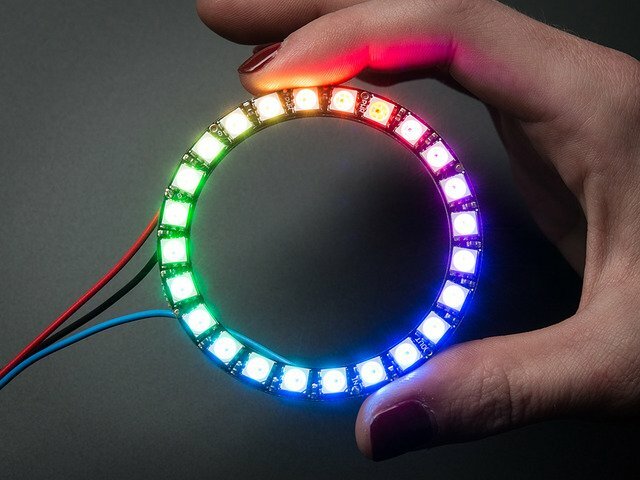 We will need the Adafruit MotorShield library. Learn more about this library and download it here. You probably already have this installed if you followed the previous page but triple check now! Once you have the libraries installed, you will want to download the latest rover code. Click the button below to download. Then, place this folder in your Arduino sketches directory and open the sketch Ada_CurieBot_RC. There are a few other sketches included in the download which you'll use later on in this guide. We use a for loop to slowly ramp up the speed until it hits max speed. Learn more about for loops here. Load up the Bluefruit LE Connect app, and the first thing you will see is a list of available Bluetooth devices to connect to. Find the one that says Arduino 101 (or possibly named CurieBot, depending on your mobile device), and tap the Connect button. While this is a great way to navigate around obstacles, I prefer to use a something a bit more intelligent so my little robot doesn't actually have to run into things to navigate. 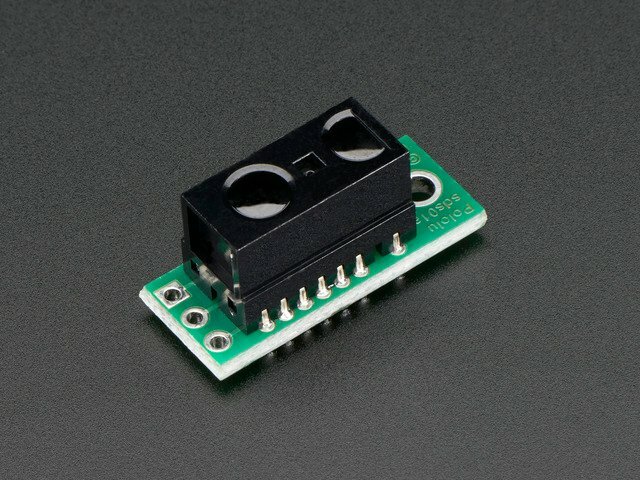 There are plenty of distance sensor options out there (there is a whole category of them on the Adafruit shop), but the sensor I am going to use is the neat little IR sensor from from Sharp. I used a couple M2.5 screws to secure the mounts to the robot (required a drill bit to clean up the holes in the 3D print). I wired up the left sensor to pin A0, and the right sensor to pin A1. // And connect 2 DC motors to port M1 & M2 ! Open the Ada_CurieBot_distanceSensors sketch in the Arduino IDE and upload it to your robot. Instead of hard coding a specific speed for your robot, here we will try out a couple different ways to adjust your robot speed without having to constantly upload new code. 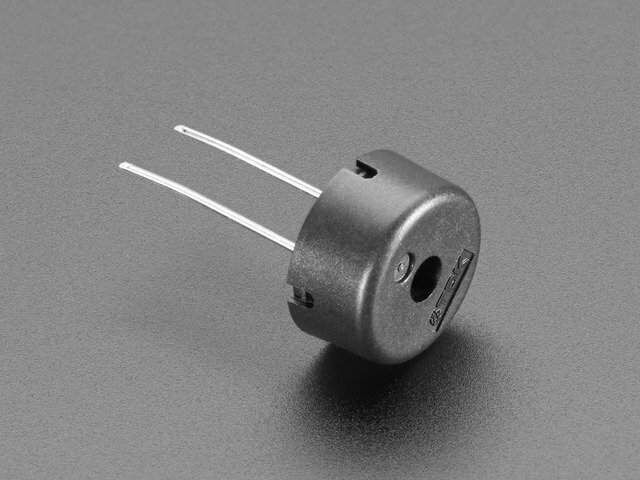 Potentiometers, or Pots for short, are variable resistors that allow us to send different voltages to the analog pin. Wiring it up is super simple. 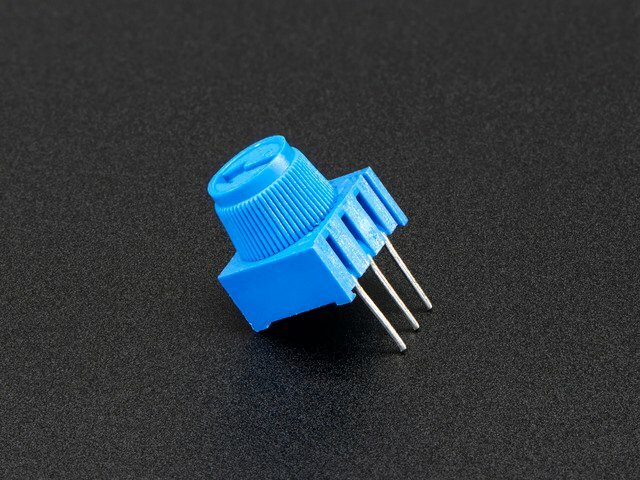 Just connect one of the outside pins to the 3.3V pin, and the other outside pin to ground. Then, connect the middle pin to the A0 pin on the Arduino 101. The code to get this all working is incredibly simple. Just copy and paste in the code below to the top of your main loop in the Ada_CurieBot_RC code. What we are doing here is reading that analog pin, and the Arduino 101 is going to pull a number from 0 to 1023, depending on which direction the arrow is facing on your pot. Because the motor controller needs a value from 0 to 255, we are using the map() function. Open the Ada_CurieBot_RC_potSpeed sketch in the Arduino IDE and upload it to your robot. Then, turn the pot, then press forward on the controller in the Bluefruit LE app to see how it works. 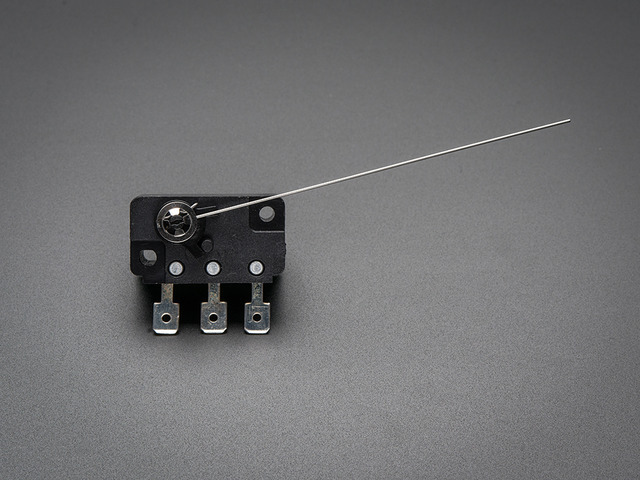 Try turning knob of the potentiometer different amounts in both directions to adjust the speed. Open the Ada_CurieBot_RC_buttonSpeed sketch in the Arduino IDE and upload it to your robot. You can add some fresh ground effects to your bot using a NeoPixel 24 ring! Solder leads to the DIN, +5V, and GND pins on the NeoPixel ring. Solid core hookup wire is a nice choice, as it can serve double duty as the structural connection to hold the ring in place underneath. Since the Arduino 101 operates on 3.3V logic level, the NeoPixel should be powered by 3.3V instead of the usual 5V to avoid problems. Open the Ada_CurieBot_RC_NeoPixels sketch in the Arduino IDE and upload it to your robot. You can now use the Bluefruit LE app's color picker control to set your CurieBot's underglow right before you go cruising! CurieBot loves to sing! You can have her drive up and serenade someone by adding a piezo buzzer and some software. Open the Ada_CurieBot_RC_Song sketch in the Arduino IDE and upload it to your robot. In this code snippet you can see how you'll use the tone() command to make music. The melody array and noteDurations array are used to describe the pitch and time value of each note. CurieBot will play "Shave and a Haircut" by default, but you can change the song to anything you like, or even add other tunes, each one controlled by a different number on the Bluefruit LE app. Now, use the Bluefruit LE app to drive CurieBot, and then whenever you press the "2" button, CurieBot will play a song! Now that you've built your own robot friend, what kinds of modifications to hardware and software will you make next? This guide was first published on Apr 01, 2017. It was last updated on Apr 01, 2017.